Over the next four years labels are changing to make it easier to find the information you need. When you buy prescription and over-the-counter medicines, sunscreens or vitamin supplements, you need important information to help you make an informed choice. Medicine labels tell you what you are buying, what the medicine can do for you and how to use it. What is changing under the new labelling rules? 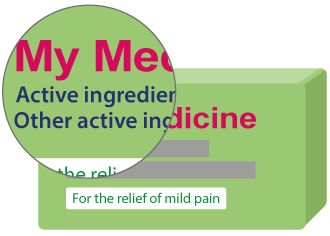 We are changing medicine labels to make important information about your medicine easier to find. These changes are the result of many years of consultation - they bring Australian medicine labels up to date with international best practice. The active ingredient is the substance in the medicine that makes it work. You probably know of paracetamol, ibuprofen or insulin - all of these substances are active ingredients. Under the new labelling rules active ingredients need to be more prominent. You will usually be able to find them below or next to the product name on the front of the medicine pack. Active ingredients will often be in a larger print size on the front label to make them easier to read. Make sure to look for the active ingredients on your medicine labels so you know what you are taking. 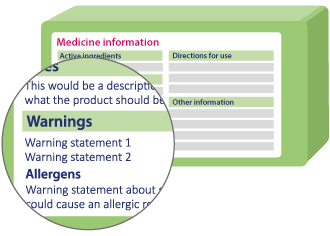 Most over the counter medicines will have critical health information in distinctive tables to help you use your medicine safely. Over the counter medicines are medicines that you buy without a prescription. The new rules mean that critical health information will always be displayed in a consistent order and will be easy to recognise. Always check the critical health information before you take your medicine. Under the new rules more substances that could cause an allergic reaction will need to be included on labels. These substances include crustacea, fish, eggs, soya, milk and tree nuts. For non-prescription medicines this information will be on the label. 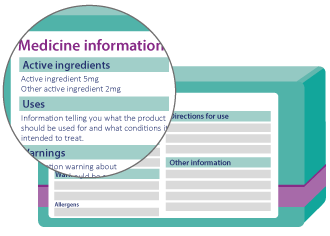 For prescription medicines this information must appear on the label or in the Consumer Medicine Information leaflet with a prompt on the pack. The new rules include a minimum space for dispensing labels. These are the labels that pharmacists stick on prescription medicines with information from your doctor. 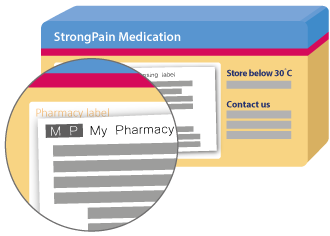 This space makes it easier for the pharmacist to attach the dispensing label without covering up other important information. Hazel takes a number of medicines for her different medical conditions. Before she runs out she always visits the pharmacist to fill her repeat prescriptions. 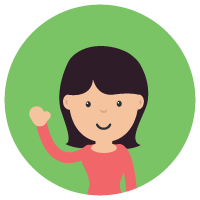 Previously, when the pharmacist offered Hazel the generic brands, she didn't take them. She was used to taking certain medicine brands and worried that she would accidentally take the same type of medicine twice if it had a different name. Her pharmacist explains that, under the new labelling rules, the active ingredient for her medicines is in larger letters under the brand name on the front label. 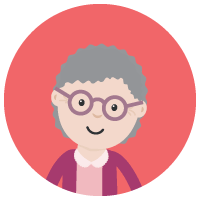 Hazel is confident that she will recognise when two medicines have the same active ingredient, even when the packs look different. She knows when to take each medicine and can avoid accidentally taking extras doses of the same ingredient from different brands. Why are medicine labels changing? Labelling requirements for Australian medicines are being updated after many years of consultation with industry, health professionals and the community. The changes help bring Australian medicine labels up to date and align them with international best practice. They will help Australians to make more informed choices about their medicines and use them more safely. Kate wants to try a new medicine to help with her arthritis. She goes to her pharmacy and selects a cream to use on her knee. Under the new labelling rules more allergens, such as tree nuts, have to be disclosed on medicine labels. Kate is quickly able to see that the new medicine contains tree nut products and therefore is not an appropriate choice for her. Because of the new labelling rules Kate can make a more informed choice for her health. The new labelling rules took effect from 31 August 2016. There is a four year transition period to allow medicine manufacturers time to update their labels and to sell their existing stock. This means that after 31 August 2016 you may start seeing updated medicine labels, but you could still see older labels as well. During the transition period both versions are acceptable - manufacturers need to meet either the old or the new rules. From 1 September 2020 all medicine labels will need to meet the new rules. On his way home, Dave buys some cold medicine at the supermarket. He has a headache so when he gets home he takes his usual pain relief medicine. 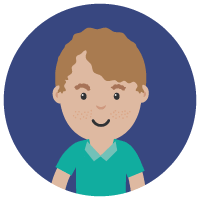 Before bed, he wants to take his cold medicine, but when he looks at the label he recognises that one of the active ingredients is the same as in his usual pain relief. He then checks the critical health information panel on the back of both medicine packs. He easily finds the warning headings on each and sees that he should not take the cold medication if he has already taken the pain relief medicine. Dave waits until the next morning to take his cold medicine so that he doesn't take too much of the same active ingredient. What other information is on my label? Medicines sold in Australia will have either an AUST R or an AUST L number (but not both). AUST R medicines (also known as registered medicines) are assessed for quality, safety and effectiveness before they can be sold. They include all prescription-only medicines and many over-the-counter medicines. An AUST R number means the medicine is more tightly controlled and regulated. AUST L medicines (also known as listed medicines) are lower risk self-medication products. They are used for minor health problems and are less regulated than AUST R.
Listed medicines include fish oils, multivitamins and herbal and homoeopathic products. Labels have to tell you how to store a product - some medicines lose their effectiveness if not stored correctly. This is similar to the use-by date on food. Medicines should never be used after their use-by date - they can lose their effectiveness or even become unsafe. The batch number and name and address of the supplier can be used to trace a medicine if a problem is found. Information to help sponsors understand the new labelling requirements and timing of changes.